Many alchemical emblems are allegorical and involve humans, divinities and animal forms, but a few are abstract. An example of a more abstract emblem was a drawing from the Vatican manuscript Ottoboni Latini 3032.Here is another abstract emblem. It is the concluding image in a series of eight drawings in a 17th century manuscript in Leiden, Codex Vossiani Chemici Q.61. A geometric form is set within a circle named as 'Mesocosmus'. This is the middle cosmos between the Macrocosm and the Microcosm. Around the circle are the words "omnibus sed paucis luceo" - which could be rendered, 'all things are, but I illuminate only a few'. We note the four small circles associated with each of the elements placed at the corners of a square. Fire and Air have the interconnecting bar of the square stating "active" while Earth and Water are linked as "passive". Fire and Earth are linked by the vertical side of the square which identifies them as "sulphureal" while Air and Water are "mercurial". This square is set within an octagon which enables the creator of the image to label Fire as dry and hot, Air as hot and humid, Water as humid and cold, and Earth as cold and dry. Within the square is a triangle centred on a large circle labelled "lapis philosophorum" and it is this stone of the philosophers which is emitting light and illuminating the material around it. On the vertices of the triangle are three small circles. That at the top is labelled with the mysterious substance "azoth", while on the bottom left we have Sol and on the right Luna. That these are three independent substances is indicated by the lines connecting them which state "is not". Thus Azoth is not Sol, and so on. However, there are three lines connecting them to the central circle stating "est" is. 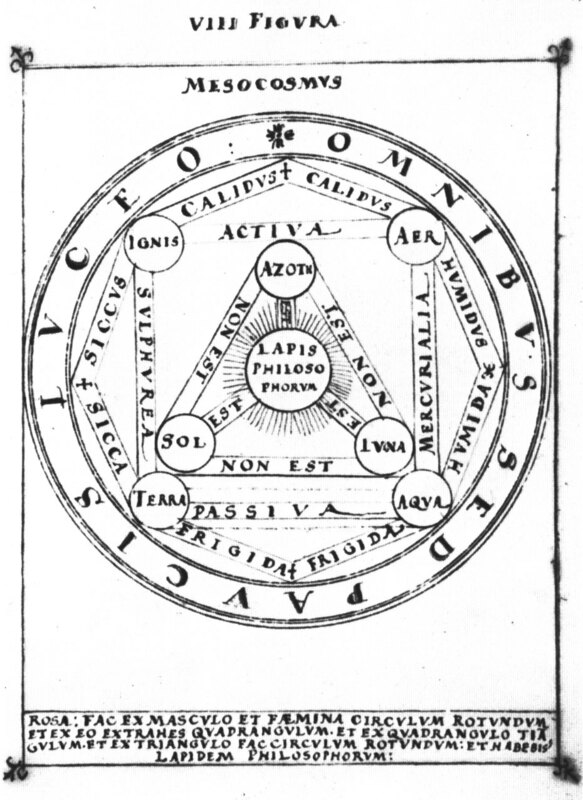 Thus these three things Azoth, Sol and Luna are the philosophers' stone, or the components of it. The sentiment here is very simple but delightfully and clearly expressed using these geometric forms. Make a round circle from the male and female, and from this you should draw a square, and from this square a triangle, and from this triangle make a round circle and you will have the stone of the philosophers'. The geometry of this drawing mirrors this. We saw this same allegorical statement in the discussion about the Vatican manuscript illustration.